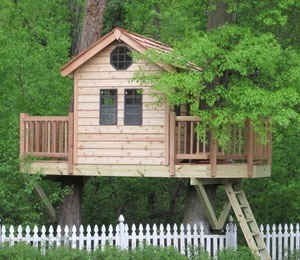 Tree Top Builders has been safely putting people in the tree houses of their dreams since 2003. Our first project is still standing, in terrific condition and the host tree is doing great. Fast forward to today, Tree Top Builders has built over 100 tree houses; our best-in-class building practices have matured and our construction methods are even safer, better and longer lasting. Years of building has unleashed our creativity – now you can expect a fantastic tree house built of diverse materials and attached with care to the living foundation. Your custom design will compliment your landscape and blend in with the natural environment. Our expertise makes our projects the most practical, beautiful, unique, and most importantly, the safest tree houses possible. Tree House Construction is known to be many centuries old, but only in the last couple decades have companies started building custom tree houses as their primary business activity. Building a tree house is easy, but building a safe, long-lasting, and tree-friendly tree house requires expertise and professional competence. We have grown adept at working around natural, treehouse specific, building challenges such as leaning trees, uneven terrain, great heights, or branches passing through the floor, walls, railings, and/or roof of the tree house. We care about building in a tree friendly, safe, and high quality manner – it is our passion and life’s work. It sounds simple, but you should not assume all treehouse builders offer the same professional approach. We regularly maintain and repair our work, so we understand very well that many building methods out do not stand the test of time. We believe that honesty, integrity, patience, and technical competence are essential. Without these, either safety or tree health will suffer. Care must be taken to prevent the tree from entering a spiral of increasing harm. Remember, a treehouse typically only lasts as long as it’s host tree. Often, by the time we are called in to assess and repair an old structure, the trees have greatly suffered. It takes insight and experience to know how the tree and house will interact over time; that’s what we bring to each and every project. On a more personal note, safety for all project inhabitants is always on our minds at each phase of construction. Dan and Amy have 3 young boys. The boys like to visit local treehouses, climb ladders, ride zip lines, use the climbing walls and bounce across the rope bridges. They grab tools and “help” build because that’s what their daddies’ do. The older two boys run around testing every section of the tree house for weaknesses. We have spent so much time with our kids at various tree houses, that we know what makes them safe and fun for kids. We take building and construction very seriously. We build each and every kids’ treehouse like it was being built for our kids to play on and grow into, and that’s why you can trust that even our most basic kids’ structures have mom’s and dad’s safety seal of approval.